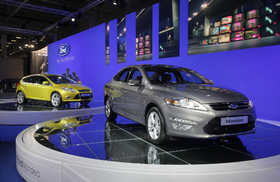 Ford unveiled a face-lifted Mondeo (right) at the Moscow show. The car is seen with a Focus (left). MOSCOW (Reuters) -- Luxury carmakers have descended on Russia to rally the nation's long list of billionaires to snap up their latest models in the wake of last year's industry collapse. Porsche, Jaguar, Cadillac and Bentley are among a host of high-end manufacturers renting space at this year's Moscow auto show. All four companies expect Russia sales to grow this year as the industry recovers from last year's crisis, driven by rising consumer confidence among the super wealthy and in some cases a restructuring of sales and dealership networks. "In the first half of this year sales increased by 35 percent ... We did not expect such increases, so now we do not have enough cars for our clients," said Vagif Bikulov, general manager of Bentley's Moscow dealership, ahead of the show's launch of the Bentley Mulsanne in Russia. Russia's auto show did not take place in 2009 as the global economic meltdown devastated car sales in Russia -- a coveted target for foreign players who see it as a high growth market. Organizers of the show, which opens to the public on Friday, expect more than 1.5 million driving enthusiasts to view more than 600 cars over 10 days at the 100,000 square meter arena, including eight premiers. Among the most talked-about cars is a new silver Porsche 911 that costs a minimum of 11.5 million rubles ($287,500) -- not including optional extras such as a $10,000 spoiler -- and an armored Jaguar XJ for security conscious oligarchs. "Porsche sales were down 35 percent in Russia last year -- more than in our other markets -- but what the crisis showed was the need to further develop the dealer network -- 2009 was a year of learning, restructuring," said Porsche Russia chief Thomas Startzel. He added that sales have been improving since January. "It's very important to have a dealer network dedicated to Porsche -- we need test drives, racing tracks -- we have no real working (tracks) in Moscow," he said. The Porsche 911 is the only one of its kind being sold in Russia, and the company said four individual customers were in competition to buy it. Mass-market producers such as Lada-maker AvtoVAZ have enjoyed a sharp upturn in growth this year thanks to a government sponsored scrapping scheme, but the high-end carmakers said consumer confidence and new models had helped. David Steele, director of sales and marketing at Tata Motors Ltd.-owned Jaguar, said it had been able to ride out the worst of the crisis due to the timely release of new cars. "It was a dreadful economic change, but because we had a new car (the Jaguar XF) in 2008, we were able to sail through the seas," he said. He added that Russia was a key market for Jaguar and partner Land Rover, partly due to the high population of wealthy individuals in Moscow and prevalence of expensive cars. "I look out of the (car) window and it's like a child in a sweetie shop -- there are Lamborghinis, Bentleys, Porsches -- and more concentrated than every other city I have been in," Steele said.